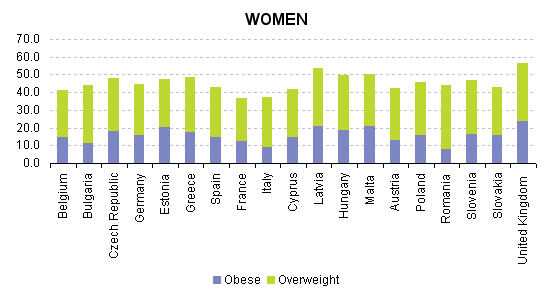 This article presents recent statistics on overweight and obesity in the European Union (EU). Weight problems and obesity are increasing at an alarming rate: over the last decade the proportion of the population that is overweight has increased considerably in most Member States, resulting in more than half the EU population being overweight or obese. Obesity is a serious public health problem, as it significantly increases the risk of chronic diseases such as cardiovascular disease, type-2 diabetes, hypertension, coronary-heart diseases and certain cancers. For individuals, psychological problems associated with obesity are common, wide-ranging and potentially serious. For society, obesity has substantial direct and indirect costs that put a strain on healthcare and social resources. Among the 19 Member States for which data are available, the proportion of overweight and obese people in the adult population varied in 2008/09 between 36.9 % and 56.7 % for women and between 51 % and 69.3 % for men. 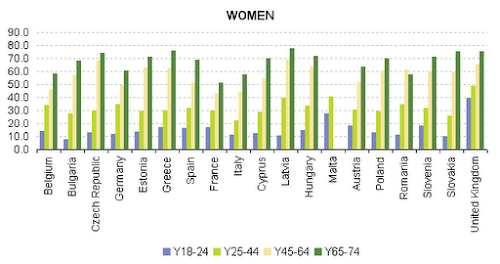 For both women and men aged 18 years and over, the lowest shares of obesity in 2008/09 were observed in Romania (8.0 % for women and 7.6 % for men), Italy (9.3 % and 11.3 %), Bulgaria (11.3 % and 11.6 %) and France (12.7 % and 11.7 %). The highest proportions of obese women were recorded in the United Kingdom (23.9 %), Malta (21.1 %), Latvia (20.9 %) and Estonia (20.5 % in 2006), and of men in Malta (24.7 %), the United Kingdom (22.1 %), Hungary (21.4 %) and the Czech Republic (18.4 %). There is no systematic difference in obesity between women and men across the Member States available. 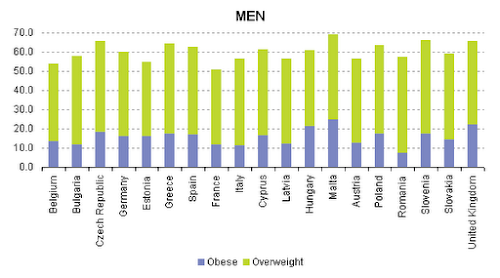 The proportion of obesity was higher for women in eight Member States, higher for men in ten and equal in one. 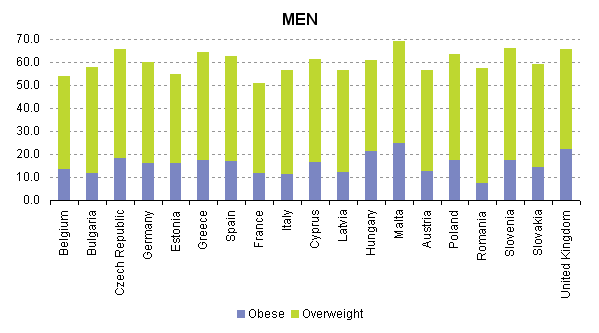 However, for overweight there is a clear gender difference: in all Member States available the proportion of overweight men is much higher than for women (differences from 8.5 % in Hungary to 18.2 % in Slovenia). The share of overweight and obese persons increases with age. The average difference between the youngest and oldest age groups is for men around 44 % and for women around 53 %. 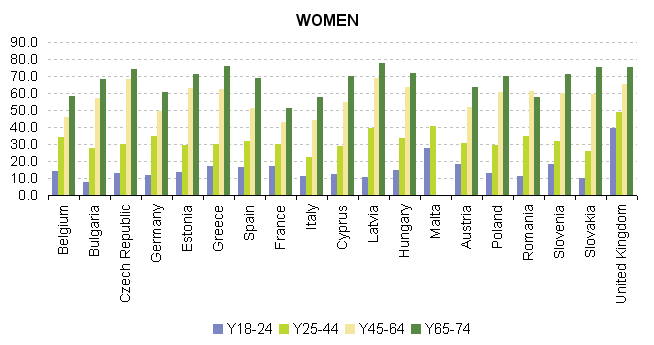 For women there is a clear pattern in all the Member States available: the older the age group, the higher the share of overweight and obese persons. For men, the pattern is a little different: increase of overweight and obesity is systematic till 65. For the age group 65-74 the picture is less uniform: For seven of the Member States available the highest share of overweight and obese men was recorded for the age group 65-74. The share of overweight and obese persons tends to fall with educational level. For women, the pattern is clear in all Member States available: the proportion of women who are obese or overweight falls as the educational level rises. For women the differences between lower and upper education level vary between 12.8 and 36.7 %. For men, the pattern is again slightly different. Differences are smaller and the distribution is different: in 8 of the available Member States, the highest share of overweight and obese men is observed for those with the lowest educational level, in six Member States for those with a medium educational level while in 4 countries it is for those with a high educational level. Overweight and Obesity — BMI Statistics. Eurostat — Statistics Explained, 2012.